KOL NIDRE -- Listen to Cantor/Rav Bronwen Mullin's beautiful rendition of Kol Nidre... Click below to listen! 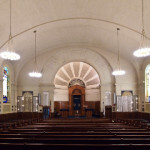 [audio wav="http://bethmordecai.org/wp-content/uploads/2015/09/Kol-Nidre-Kol-Nidre.wav"][/audio] You may also enjoy Cantor Mullin's moving hineni prayer from Rosh Hashanah, 5776 (2015). NOTE: Rabbi Mullin has completed rabbinic school and is working in Manhattan. She will not be joining us for High Holidays this year. Our 5778 High Holiday cantor is Anna R. Chapman. Additional information coming soon.